You are fed up with spending a ton of time and money on “boilerplate” marketing, just to wind up looking and sounding like everyone else in your competitive space. It’s not that you haven’t tried, but you know deep down inside, that something is broken with your marketing. And you can’t quite put your finger on it. But, you know something has to change. 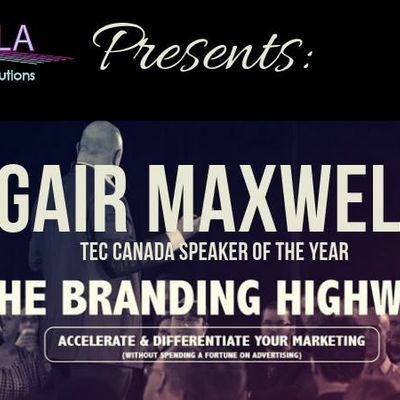 After more than 500 presentations throughout North America, Europe, the UK, Mexico and elsewhere, THE BRANDING HIGHWAY is Gair’s signature program; one that emphasizes leadership, vision and how to generate more “inbound” business from your marketing efforts in 2020 and beyond. In other words, how does any business naturally and magnetically attract prospects, customers and talent with a “pull” strategy similar to the best brands in the world? How can anyone become the “Apple”, “Ferrari” or “Harley-Davidson” of a specific category and organically attract people like bees to honey without having to beg for business? 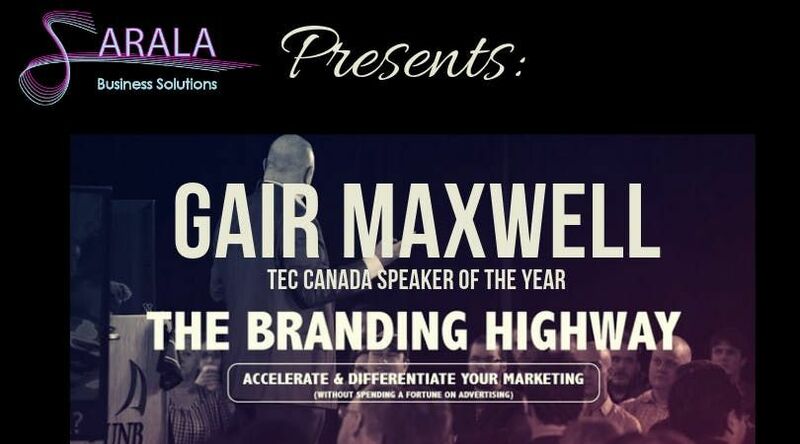 Sarala Business Solutions is honored to present TEC Canada “Speaker of the Year” Gair Maxwell, & THE BRANDING HIGHWAY; a high voltage presentation which inspires any firm of any size recognize how to: create substantial DIFFERENTIATION, turn customers into ADVOCATES and establish a brand legacy that rivals some of the best in the world. Join us at the home of the Calgary Flames , the Scotia Bank Saddledome for an adventurous, wide-open ride on THE BRANDING HIGHWAY and discover how otherwise ordinary companies have achieved extraordinary 15-20X growth over a 5-year period, and inspired employee buy-in ... all while slashing their advertising budget! In a nutshell, this program sheds unusual clarity on the issues of DIFFERENTIATION, RELEVANCE and how to create a LEGENDARY, IRRESISTIBLE brand. Sarala Business Solutions experienced this journey back in October and now we want to share the experience with you. At Sarala, we’ve learned that companies would like to expand their business, but don’t always have the time, resources or the clarity required to outdistance the competition. Sarala helps to simplify the co-ordination, execution and unification of a customized marketing plan and we believe THE BRANDING HIGHWAY is crucial to jump-start the process. Sarala Business Solutions & Gair Maxwell are dedicated to giving you the tools required to help ACQUIRE and RETAIN new customers. Save you oodles of TIME & FRUSTRATION, boost PROFITIBILITY and maximize your company’s POTENTIAL.